Got a message from a photography friend about a location to photograph the full Moon rising over the Syracuse University campus last Tuesday night. For most of the day it did not look good with a solid overcast sky. Late in the afternoon, the cloud cover broke up and off I went. While I did not get the photo I was looking for as I was late getting to the location (long story involving mistaken identity, fences and my iPhone saving the day). I did get the following photographs which I am thrilled with. 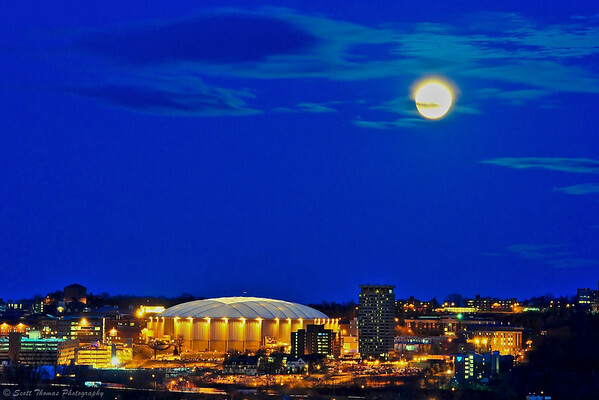 Glowing full Moon over the Carrier Dome on the Syracuse Univeristy campus in Syracuse, New York. Nikon D700/80-400VR, 0.8s, f/11, ISO 2500, EV 0, 195mm focal length, tripod. The photo above was planned to look that way. I knew if I exposed for the lights of the Carrier Dome, the shutter speed would be too long for the Moon. In fact, the Moon moved during the exposure and was blown out. In processing, I recovered the blown out regions as best I could and left the glow about the top of the Moon. After getting my Moon shots, I turned my attention to the City of Syracuse. The beautifully lighted Most Holy Rosary Church was the natural subject to anchor this scene. 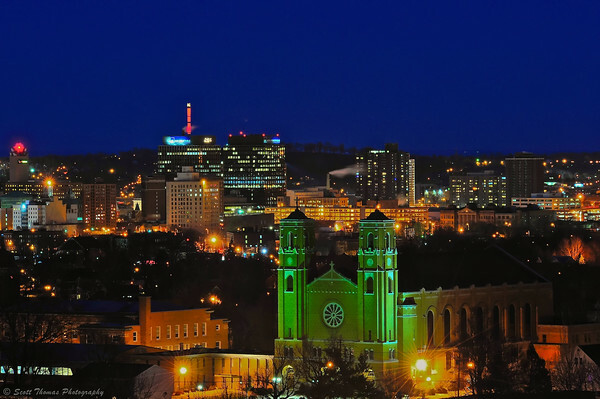 Most Holy Rosary Church with the City of Syracuse, New York skyline behind it. Nikon D700/80-400VR, 5s, f/16, ISO 800, EV 0, 195mm focal length, tripod. I will have to re-visit this location, a reservoir just south of Syracuse, again as I continue to chase the Moon. This entry was posted in Weekly View and tagged 80-400mm, arena, blue hour, campus, carrier dome, church, full, lights, moon, most holy rosary, new york, night photography, nikon D700, syracuse, tripod, university, vr. Bookmark the permalink. These are awesome! I went out chasing the moon on Monday and did not get the shot I wanted, but so glad I tried because Tuesday was totally overcast in my area. I was sweating it out all day. It did not look very promising until about 3:30 in the afternoon when the clouds started to break up. Whew! Very fine captures of the light – moonlight and human light. The first photo is a prize-winner, perfect composition and the colors of the city and the sky are great – and I love those light clouds around the glowing moon. Thanks, Truels! The conditions, light and weather all came together for me. The D700 does handle high ISO’s very well. In this case, there was noticeable noise in all the deep blue sky so I did run some noise reduction using Noise Ninja on both of these photos. The top photo was a challenge in that I exposed for the campus buildings but did not want too long a shutter to show movement of the Moon. That is why I used a high ISO as I was in full manual mode for these photos. Absolutely lovely photos, especially the one of City of Syracuse. Absolutely stunning Scott, it has been a while since I last saw the city skyscrapers. .
Syracuse is a small city which is nice as it is easy to get around. It has it’s charm though especially at night. We moved from Syracuse a few years ago and would like a few pictures from there. Do you sell prints?